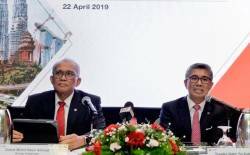 14 Feb 2019 / 11:48 H.
KUALA LUMPUR: RHB Bank Bhd has launched and priced a US$300 million (RM1.22 billion), five-year senior unsecured notes, marking the third issuance of its US$5 billion Euro Medium-Term Note (EMTN) Programme. 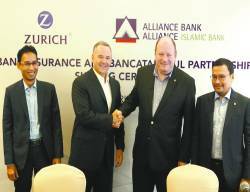 The programme, which was established on Sept 23, 2014, is the first US dollar public benchmark issuance by a Malaysian financial institution since April 2017. The orderbook at the final price guidance stood at over US$1.8 billion, implying an oversubscription level of over 6 times from 114 accounts, according to RHB Bank’s filing with the stock exchange. “The strong demand allowed RHB Bank to tighten guidance to 128 bps over five-year US Treasury at a yield of 3.76% per annum, representing the tightest credit spread for Southeast Asia/South Asia Issuance to date in 2019,” it said. By geographical distribution, the bank said Asian investors were allocated 95% and European investors 5%. In terms of investors’ type, fund managers and insurance companies were allocated 67% of the issue while banks were allocated 29% and the remaining 4% were allocated to private banks. The senior notes are rated “A3” by Moody’s Investors Service Inc. The issuance of the senior notes is expected to be completed by Feb 19 and will be listed on the Singapore Exchange Securities Trading Ltd and Labuan International Financial Exchange Inc.
RHB Banking Group managing director Datuk Khairussaleh Ramli said it is pleased with the strong interest in its US$300 million bond issue, which is able to attract interest from a diverse investor base across Asia and Europe. 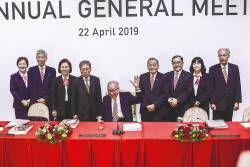 “The pricing level reflects the strong confidence from the global investment community in RHB Bank as well as the overall investor sentiment towards Malaysia,” he said. 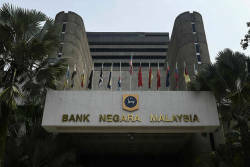 The net proceeds from the issuance of the senior notes will be utilised by RHB Bank for general working capital purposes. RHB Investment Bank Bhd, Credit Suisse (Singapore) Ltd and The Hongkong and Shanghai Banking Corp Ltd are the joint lead managers for the senior notes issuance.